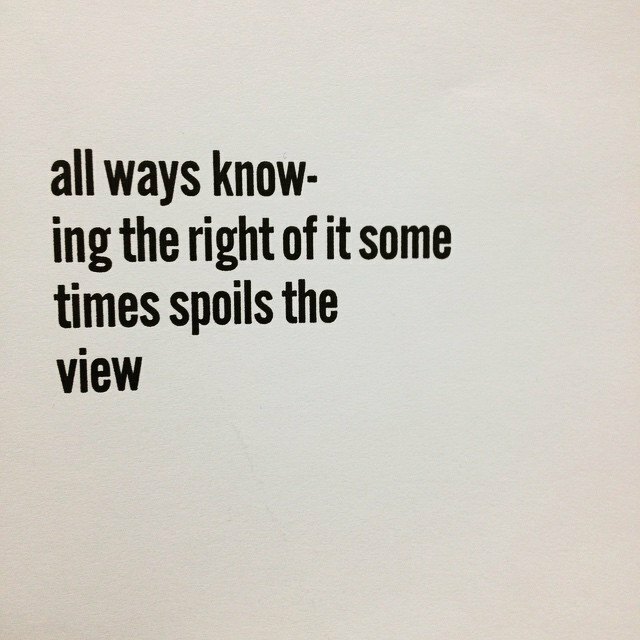 below are excerpts from judi goldberg‘s blog on the creation of the ALL WAYS KNOW- chapbook, a collaboration between three members of the NBLA Co-Op. see megan's perspective here and katie’s perspective here. if you want to work on your own book art or printing project, don’t hesitate to contact the NBLA. and after the conversation it feels like we’ve made some decisions but then of course there’s always so many details which haven’t been sorted yet but that’s the adventure of it, right? The Decision, the Important One – theonlyonethatmatters? has been made. That we’re doing this. Whatever itthis is. Yes!" "so the thing about setting, well one of them anyway, makes you very aware of each letter, each word. do I really mean this? is this worth pulling out the letters for? although with the time limit sometimes some things sneak in even if they are not quite Right which then we’ll have to decide about edits and so then for me it also becomes about the space as an element what’s not there as part of the composition and how it looks which doesn’t necessarily have anything to do with how it sounds although hmn there’s a whole nother rabbit hole to go down but for now, the visual – the rhythm of it, and one in particular I played with the readability of it. so thinking about the looking at it of it, if you see what I mean." speaking of which, behave that is, judi had said – before starting to print hers – i will try and behave which is not what she’s known for so I asked behave??? in what way? and why? her response by behave i mean (as best i can) follow the agreements as we stipulated…"
"OK, cut the sting. Don’t get sidetracked with options. 10 inches. Cut the damn string. Oh these scissors are too big. This is going to take a while one at a time … zzzt zzzt zzzt light bulb flickering noise DING! Cut a piece of cardboard, wrap around, cut at the ends. DONE. Why didn’t I just do that sooner?" "next evening a few more pages, 72.2%! and then the remaining poems the next. there’s a rhythm to it now, although the various papers all are a little different in how they take the glue and how well they play with the string but it’s all good. Soundtrack: Foo Fighters, The Colour and The Shape; Them Crooked Vultures; Steve Earle, I Feel Alright; Mark Knopfler and Emmylou Harris, All the Roadrunning; Joe Ely, Letter to Laredo; Jo Carol Pierce, Bad Girls Upset by the Truth; Evan Lurie, Selling Water by the Side of the River." "SusanAmalia (who is actually the only Susan in the group, but for some reason quite often gets referred to with her last name) asked what we had gained from it. Hmn. Good question. That in working on a collaboration there is still some of the same dithering that happens when I work on my own, and some that is different, but overall the working with others helped keep momentum. That external motivation… AND!!! That something like this is NOTHING like the “group project” bane of my school days – where more often than not it took longer to come up with something that was worse than what I could have done on my own – but infact working with others can be a splendid joyous sharing where we come up with a sum more than the parts." 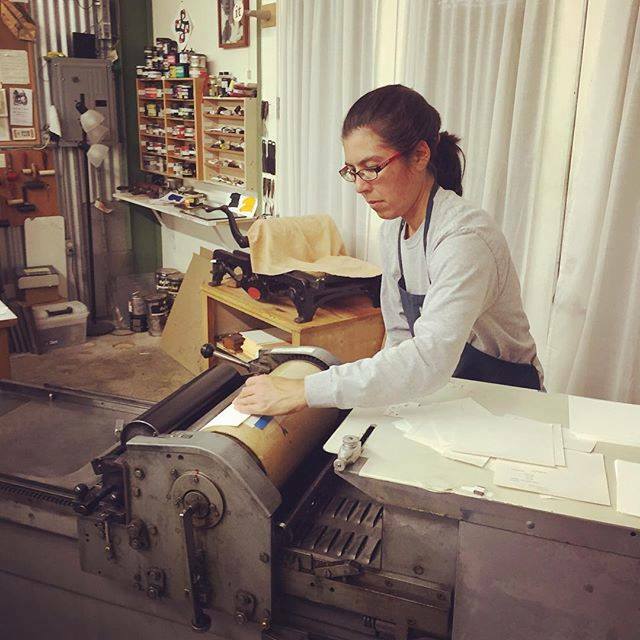 as mentioned by judi in one of the newest NBLA videos, the print shop in sebastopol is not just a place where people pop in and out, keeping their head down and art to themselves. what i found to be the most rewarding part of joining the Co-Op was the support it provided and collaboration it sparked between myself and other members. i think that is why, when judi, Megan, and i discovered that we were all composing poems at the case for National Poetry Month in 2015, it seemed natural that we would combine our work into a collaborative chapbook. each of us had a different set of loose parameters (shop rule: the only rule is that there are no rules!) when composing. mine was: limiting myself to thirty minutes of typesetting an unwritten poem, on the fly. this has become a regular strategy for me when starting new poems. decision making was probably the most difficult part of the project for the three of us (in my eyes) -- probably because there were so many possibilities and i, for one, was nervous about making design decisions about other peoples' art. these are the decisions we reached: 5 poems per person, indentidingbats in the lower right hand corner, bfk rives (white), black ink, a 6x6" layout. otherwise, we let ourselves play with placement on the page, subject matter, and paper for bindings. Megan and judi have finished binding their copies and will follow up with their thoughts on our collaborative chapbook. if you want to work on your own book art or printing project, don't hesitate to contact the NBLA.